And What's So Good About Them. For around 18 years I rode my mountain bikes without dropper posts... because they didn't exist. At least not how we know them today anyhow. For the next couple of years, I resisted using dropper posts because I didn't want the weight disadvantage and besides, I'd gotten through 18 years of riding and racing cross country and all mountain bikes without ever needing no stinking dropper post! Resistance to change can be beneficial. On the other hand, you can seriously restrict your own progress if you remain closed minded and ignorant of what the change may offer. In this article we'll look at what is currently (at time of writing) one of the biggest changes to how we ride in some time. What is a dropper post? For those not familiar with dropper posts, they are simply a remotely activated seat post that allows you to quickly adjust the height up and down, while on the move. How do dropper posts work? A lever on your handlebars allows you to use your body weight to lower the seat and then raise it back up to full height again. You simply set the dropper post to the full height you choose (high for maximum pedalling efficiency as an example) and when you hit the button while your body isn't on the seat, it pops up to that full height after being lowered. This means you can have better efficiency for any part of the trail without having to stop and adjust the seat. Rather than simply riding less safely or efficiently on some parts of the trail because you don't adjust the seat, a flick of the remote lever and you can always have your seat in a good position/height for whatever you are tackling on track. This adjustment movement is usually achieved with a telescopic design and an internal gas cartridge. Dropper posts are usually offered as either internally routed or externally routed. If your bike has cables internally routed already, then choosing an internal routed dropper post is the best choice to keep things uncluttered on the bike. If your bike has no internal cables then you'll need an externally routed dropper post so you can run the cables along the frame to the handlebars. The 'drop' (distance the post compresses to) of the post is another consideration when purchasing a dropper post. Dropper posts from some brands come in several drop lengths and 100, 125 and 150mm tend to be most common although a few offer 170mm or more. Some are only available in one drop length. The larger the frame, the more drop you may be able to use. When purchasing a dropper post you need to consider the overall length of the whole dropper post unit to be sure it will fit inside the bike frame's seat tube. You also must purchase the correct diameter post to suit the bike frame. Like many products in our lives, we often get what we pay for. And sometimes we don't. And surprisingly, it's not always as easy as choosing one of the big brands. The quality in dropper posts can vary across a range of elements that make up the post. We strongly suggest reading current reviews and users comments you find to make an informed decision. Scared you off yet? If it helps, at the time of writing I had recently had to buy a new dropper post for my all mountain bike. After looking at many reviews and comments around the internet, I could see that the Fox Transfer dropper post always reviewed very well. So I purchased one of those and I'm very happy with it. This is not to say there aren't others out there worth considering, especially seeing as many are less expensive. It's just the way I went. Like most things in mountain biking, there are often pros and cons. 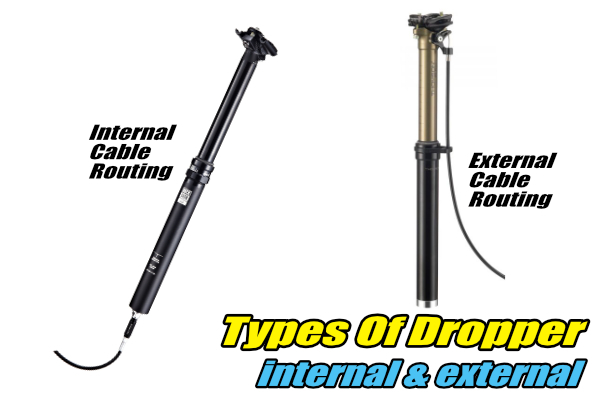 What advantages and disadvantages do dropper posts offer? Weight - As mentioned above, weight is one consideration. Dropper posts vary in weight, as do solid posts, so the weight difference between the two varies. The difference is usually within cooee of 500 grams, which to the weight weenie, is a significant amount. However, when weighed against the advantages gained, maybe not? Maintenance - Another part on your bike with moving parts is usually going to mean more maintenance. Where the telescopic tubes slide together needs to be kept clean and lubed. Depending on the brand, lube can be required quite often, or for other brands it can be a rare need. The remote cable may need replacing or adjusting from time to time. The internal gas cartridge may even need replacing one day. Cables - If internally routed, the extra cable is only seen up near the handlebars, but does still add to the spaghetti up there. If externally routed then the cable needs to be fixed nicely along the frame and allow for up and down movement near the dropper post itself. Price - Dropper posts range in price from a couple of hundred dollars through to many hundreds, and you often do get what you pay for. Pay too little and those maintenance issues could be a common occurrence. However, even the more expensive brands need some love and care along the way. Range Of Movement - When dropped, a dropper post allows for a much larger range of body movement. This in turn allows for better weight distribution and body position which is highly beneficial in more extreme manoeuvres. Keeping your weight low and being able to freely move back, forward and sideways greatly adds to your stability and safety when rolling over steep, rocky rollovers as just one example. Advanced Skills - There are some advanced skills that simply can not be accomplished to a high (or safe) level with a solid seat post set at the optimal height for pedalling efficiency. Advanced cornering and trail pumping techniques are examples of where your body needs to move freely and often to be where the seat and post already are, when set at the optimal height for pedalling efficiency. Mounting & Dismounting - An added bonus is you can lower your dropper post as you stop to allow your feet to touch the ground and then easily swing a leg over the bike to get off. Getting back on is obviously made easier as well. Getting on and off a bike with a solid post set for pedalling efficiency isn't a huge drama, but the dropper post does have this conveniency which is nice along with the other advantages. Transporting - If your bike travels in the quiet and comfort inside your car, then being able to lower the seat height easily sure makes the job of putting the bike in and out of the vehicle much easier. If your bike shares a rack with other bikes, being able to quickly lower the seat height to avoid clashes with the other bike's handlebars etc is again a great convenience to have. So then, a few hundred grams of added weight, possibly a little maintenance and another cable on your bike allows for you to gain stability and the ability to better handle more advanced manoeuvres along with other convenient benefits. Riders often discover they will ride more difficult sections of trail with a dropper post lowered than than with a solid post set high. What sort of bikes and riders need dropper posts? Maybe you and your bike? Let's investigate. Dropper posts have actually been around for a long time, even though it's only in recent years that they have been consistently included as original parts on new bikes. Probably most notably, on the longer travel bikes of around 160 - 170mm commonly called 'Enduro' bikes. These bikes are designed to handle the more extreme trails that are more and more common as a challenge between cross country race trails and the extreme downhill tracks. Enduro type bikes have geometry that suits rough descending more than climbing and their suspension systems reflect that performance requirement as well. At the time of writing, buying an enduro bike without a dropper post is almost an impossibility. In fact, most 'all mountain' bikes (also called 'trail' bikes these days) with their 130 - 150mm travel range, come with a dropper post on them now. We are even seeing many cross country hardtail and full suspension bikes of 100 - 120mm being supplied with dropper posts. There must be a reason for this. It's about being physically able to get the most out of the bike's capability. No point having a bike that can't be utilised to your own potential for the sake of a seat that gets in the way. So above we've just mentioned how the evolution of bikes has made them more capable and how having a dropper post helps the rider to get the most from their bike. But do all riders need a dropper post? Tough question. For someone who rides infrequently and is of limited skills and rides mostly green (beginner friendly) trails, then no, probably not. Although, looking at the list of advantages above, they would benefit in some way, however, perhaps not enough to outweigh the disadvantages maybe. With a dropper post fitted, would they find they would ride stuff they don't now? Possibly. For pretty much all other riders, a dropper post is a huge advantage if they learn to use it well. And it doesn't take long to learn. From the time you start riding blue (intermediate) trails then a dropper can be a real bonus. In the end though, each rider without a dropper post needs to evaluate the advantages and disadvantages and decide if their riding justifies the expenditure. are advantageous to any mtb rider willing to use them. are just as helpful on a full suspension bike as they are a hardtail. are suitable for most types of mtb riding. are becoming standard equipment on a wide range of mountain bikes. can help most riders get faster lap times despite the small weight gain due to better stability from lower body positions. allow a larger range of body movement which in turn allows the rider to employ more advanced skills without compromising efficiency.